Proper manager onboarding and development can have high payback for any sales force, noted the blog Why New Sales Managers Need More Training, published late last week in Harvard Business Review. Onboarding is the process of integrating a newly hired or transferred employee into the organization and its culture through the necessary skills, knowledge or behaviour. Mentoring by supervisors – A first line sales manager’s superior (typically a regional or national sales director) has many responsibilities, so coaching and advising subordinates seldom gets the attention it deserves. Some companies expect that as much as half of sales directors’ time should be devoted to coaching first line managers. One company mentioned in the blog had its sales directors regularly study first line managers to learn which skills and knowledge needed attention; directors would then organize development sessions focused on these competencies as part of regularly scheduled management team meetings. Peer learning – The number of peer mentors depends on the size of the sales team. One company divided the task of mentoring a new sales manager among five experienced managers. Each experienced manager was asked to spend two days with the new manager while focusing on one of five key job responsibilities: business planning; talent acquisition, management and development; sales tracking and execution; performance management, rewards and recognition; contracting, negotiating and pricing. 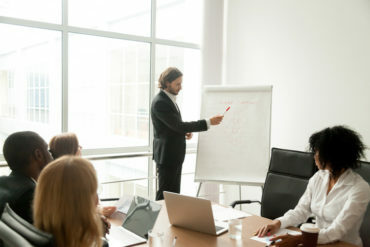 The new manager shadowed each of the five experienced managers and came out of the ten-day mentorship period with a broad base of knowledge about the job. In addition, the new manager had five different mentors they could turn to for future questions and advice. Independent learning – By providing easy access to development resources, companies allow managers to individually seek out ways to improve their skills and knowledge. One company created an online portal linking learning materials (whitepapers, books, seminars, courses, video clips, webinars) to specific management competencies. Since sales professionals tend to be unusually competitive and goal-oriented, some companies have incorporated game elements (points, badges, missions, leaderboards) into learning portals to encourage participation and make learning more social and fun. Many companies often don’t do enough to develop their sales managers, note the blog authors. The authors were Andris A. Zoltners, professor emeritus at Northwestern University’s Kellogg School of Management and co-founder of ZS Associates, a global business consulting firm; Prabhakant Sinha, co-chairman of ZS Associates; and Sally E. Lorimer, a marketing and sales consultant, and business writer. Recent research reported in Harvard Business Review confirms what is often the case in organizations: companies promote their best salespeople to become their worst managers. Sometimes companies promote the wrong person – someone who is good at sales but lacks managerial potential. Thanks for the really interesting article. What comes to mind though is that many of your readers would greatly benefit from utilizing a sales assessment test in their hiring.